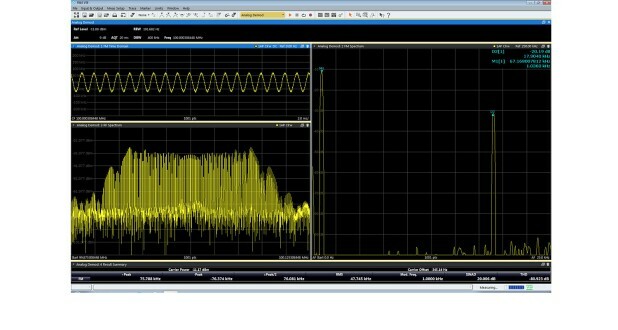 The R&S®VSE-K7 AM/FM/φM measurement demodulator option adds analog modulation analyzer capabilities for amplitude, frequency and phase modulated signals. It measures not only characteristics of the useful modulation, but also factors such as residual FM and synchronous modulation. The universal characteristics of the digital measurement demodulator option open up a wide range of applications, for example measuring frequency deviation or the frequency settling time of synthesizers. The FM measurement capability of this option enables the specific modulation measurements needed in development. R&S®FS-K7 measurement demodulator option also performs FFT analysis on the demodulated signal, allowing received signal quality to be determined from the SINAD and THD values. Various filters (highpass, lowpass, deemphasis) are available to simulate real receive signal structures and to accurately characterize analog transmit and receive systems.